This is my version of that new (to me at least, last time I was pregnant was 2004) style with the "secret fit panel", and they're pretty comfortable. They're also staying up pretty well. It would be better if I'd found jeans that were not ultra low rise to begin with but this will work, for now. I still need to serge around the edges so the denim doesn't fray, and also patch that oh-so fashionable hole on the left thigh, but they're really cool, and they went together really fast. Gosh, they sure did! We were just on the phone a couple of hours ago and you hadn't started. All done, with pictures and everything - you're my sewing goddess hero! Just what I needed! i don't want to spend money on maternity-clothes either, so thanks for the inspiration, I have some pairs of jeans left that i wont be wearing anymore! just great! 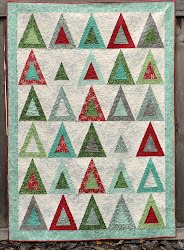 found you from googling basting a quilt. sheer genius! 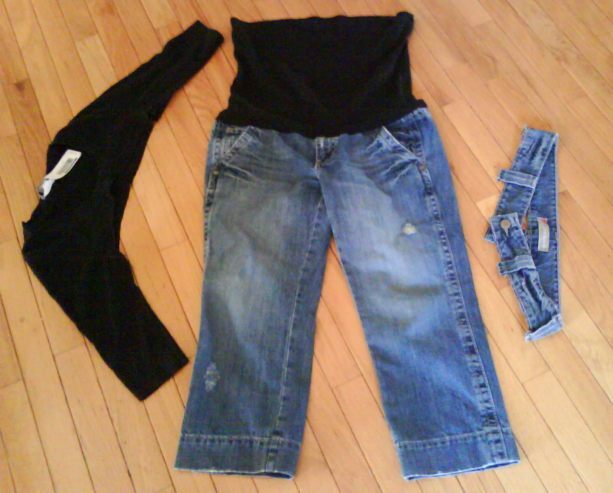 Its a great idea for maternity jeans at using this style. Thanks a lot i think that's help me..